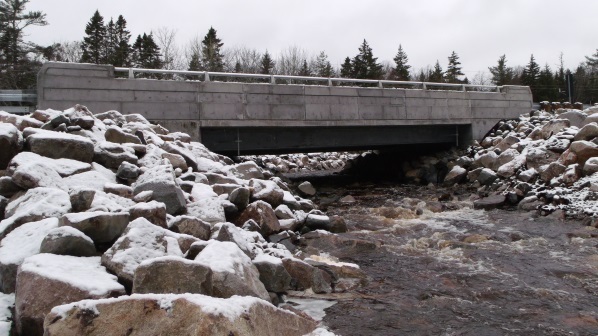 The new Wagner Brook Bridge is a 13.5 meter simple span composite five steel plate girder bridge on a 20 degree skew complete with fully integral piled abutments, cantilevered wingwalls and a cast-in-place composite concrete deck. The original tender called for two independent precast rigid frame structures. This solution required significant costly in water work and as such, HEC worked with Alva Construction to develop an alternate design following project award that spanned the full water width with a single structure and perched the piled abutments out of the water (thus allowing construction to be completed in the dry). Along with a superior final product, the alternate design provided significant cost savings to our client which HEC considers to be a key measure of project success. Design was completed in parallel with construction with HEC staying sufficiently ahead of the contractor to keep the project on schedule. Low profile steel plate girders were chosen to maintain the required clearance box beneath the structure while maintaining the existing road elevations. The alternate design and construction were completed on time and on budget.